Martin Luther King, Jr. was an American clergyman, activist, and prominent leader in the African-American civil rights movement. His main legacy was to secure progress on civil rights in the United States, and he has become a human rights icon. In 1964, King became the youngest person to receive the Nobel Peace Prize for his work to end racial segregation and discrimination through non-violent means. 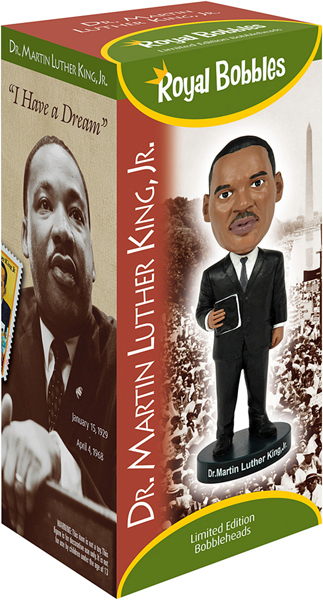 This officially licensed Dr. Martin Luther King, Jr. bobblehead is very high quality and is carefully packaged in a colorful collectors box.